Wild Horse Mesa is set in the 1890s around the Kaiparowits Plateau in Utah (ZGWS). Victor Carl Friesen’s commentary on Wild Horse Mesa (see below) set me straight about my misconception about what a cowboy was. Wild Horse Mesa is about horses. So that means NO cowboys. Horse-wranglers are handlers/trainers of horses. Zane Grey turns up in varied places. It is clear that many horse crazy people (at least in the US) are aware of who he was. One of them, a horse lover very much like this story’s main character (Chane Weymer), has a stallion named after the author (Dale Esther). His Zane Grey was as desirable as Wild Horse Mesa’s own Panquitch. I love horses too. Not in the sense that I own any, but in the sense that I would defy my mother’s injunctions against crossing a field rumored to be full of snakes (in Australia) to see the herd one farmer owned. The moment I thought of them every other thought would drop out of my head and I would defy even spankings to see my beloved horses (in the true spirit of my Aspergers). Since then their beauty and strength and ornery nature have stayed as a major component of my make-up. Herds of wild horses roamed the deserts and prairies of the West and Utah. Horse wranglers, Native Americans and Cowboys were what kept the mustangs alive despite an increasing dislike of their numbers and presence. Some people would rather have cattle or sheep. Because mustangs were needed as work animals, not all of them could be killed. Panquitch and his herd live in one of the less available areas, something that would make it a “safe place” for the horses. But not safe enough. Chane Weymer wants Panquitch even though his own horse is supposed to be a superior specimen. He is not alone in wanting to domesticate the wildness out of Panquitch. Another love of mine were Native Americans, especially the Kiowa people. Why the Kiowa, you may ask (probably not)? 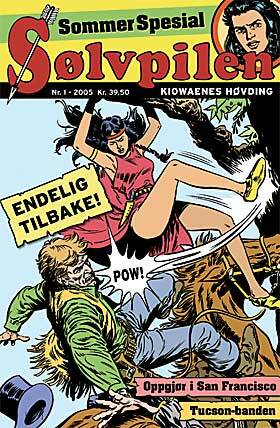 Here in Norway we had a comics series called “Sølvpilen” about the Kiowa leader, Sølvpilen, his blood-brother, Falk, and the Kiowa woman, Månestråle (the most wonderful female character I knew). I feel certain my views of what the Kiowa were had to be extremely off the mark, but having a strong female character at that time was unusual. Strong and beautiful. I believe I was in love with all three of them. While my views were off the mark, I do believe that they showed me that there was another side to the story of the Cowboys and Indians. The Indians weren’t the “bad guys” and the Cowboys the “good guys”. This view was a stronger version of the one I found in the books of Zane Grey. Except for in the story of Wild Horse Mesa. In Wild Horse Mesa one of our main characters is a Piute man called Toddy Nokin. At the time Wild Horse Mesa was supposed to be set Piute tribal land had been reduced to 5% of the original territory. Meeting the Europeans led to death from various causes such as disease and fighting for the right to live on traditional lands. (Haines & Hillstrom) This could be one reason why Zane Grey set this story where he did. Toddy Nokin’s daughter, Sosie, is another person we meet in Wild Horse Mesa. She, too, would like to ride Panquitch and her father being a horse-catcher and tamer is not a detriment to her cause. Thankfully, for Chane, both he and Toddy are friends, and so the three of them are not at cross-purposes. Government Boarding School for Girls Uintah and Ouray Reservation Whiterocks, Utah, MRL 10: G.E.E. Lindquist Papers, 63, 1662, The Burke Library Archives (Columbia University Libraries) at Union Theological Seminary, New York. Sosie is in the process of being civilized in an Anglo school. At this time Piute children were being sent to boarding schools and expected to behave in a manner the Anglos thought was civilized. Any Piute who wanted to retain his/her traditional ways were denigrated by the Inspectors and Indian Agents of the time. Zane Grey thought this type of assimilation was the wrong way to go. Sosie shows just how problematic this “civilizing” of the Native American was. Her socialization made it seem as though she thought herself superior to her family and friends left behind at home. Nor was she accepted as a true member of the Anglo community. Her color was wrong. These three and Chane’s brother Chess and Bent Manerube (ends up being the bad guy) belong to one horse-wrangler camp. the Loughbridge camp is the other horse-wrangling camp that comes into play in Wild Horse Mesa. In it we find Mel Melberne and his family (daughter Sue) and Jim Loughbridge and his family (daughter Ora). Love happens between the younger generation but not without all of Zane Grey’s fall-pits in place. And there you have it folks. All of the elements are present for a rip-roaring read of yet another Zane Grey tale.